I have trouble with bunker shots around the green where I have to carry the ball a long distance. What is your advice? I have a problem with bunkers. I hit fat shots. How do I consistently get out of green side bunker? Should your clubface always be open in a bunker near the green? I am hesitant to really hit the ball when the bunker is close to the green. Not sure how to get the ball out without flying the green. Any suggestions? How do I hit a completely buried bunker shot? 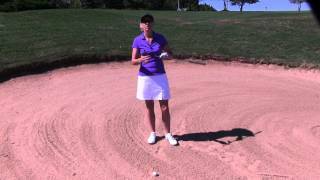 When hitting from a fairway bunker, should I always club up? 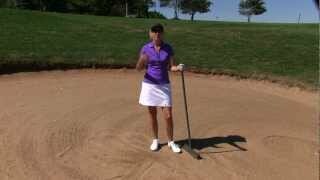 Should the rake in a bunker be left in the sand our outside of the sand? If outside of it, what is the best place to leave it? Is there a reason to use a different lofted club (besides sand wedge) if in a green-side bunker? If your ball plugs in a bunker, can you move it or do you have to play it? When you are hitting greenside bunker shots, use this trick to help determine distance and the length of your swing. Expect the ball to go about 50% of your normal pitch shot with the same swing. If your half swing sends a pitch shot 50 yards with your sand wedge, then expect it to send a greenside bunker shot 25 yards. The loss of distance is the effect the sand has when it gets caught between your clubface and the ball. When you are in the sand the depth of your stance will directly affect your distance. If you want to take more sand, dig your feet down deeper. This will force your club into the sand behind the ball (similar to hitting a fat shot off of the grass). If you want to take less sand feel like you are standing more on top of the sand. This will allow the ball to travel further. For greenside bunker shots, make sure to use a sand wedge that is made for the type of sand you most often play. For firm sand you will want a wedge with less bounce. For soft sand, play a wedge with more bounce. The bounce is the back edge of the club head and sits higher than the front edge when you are looking at the clubhead upside down. The bounce edge enters the sand first and prevents you from digging so with super soft sand you will want quite a bit more. When you are in a greenside bunker make a splash that is shallow and about the size of a dollar bill. It should feel like you are smacking the sand with the back of the clubhead and then coming right out. If your splash feels heavy or digs down too much, you are taking too deep of a splash. To practice this try putting a tee in the sand with just the top of it showing. Then hit balls trying to pick the ball off the top of the tee. This will get you out of digging and teach you to make a shallow splash. When you are in a fairway bunker, use the club that you would normally use for the distance facing you. If however you have a high lip or mound to shoot over, you may need to sacrifice distance so that you have enough loft to clear everything. If you have struggled here in the past and often come up short take one more club and choke down a bit until you gain confidence. A 3/4 length swing is often best for most players out of a fairway bunker. This affords a good amount of control while allowing the player to stay long enough to accelerate. Swinging too long often allows swing faults to break through and it is more likely that you will have inconsistent contact. Our bunkers here in Northern Iowa are filled with a fine dirt rather than the sand I was used to in California and as a result my sand shots are not coming out with the loft I'm used to. Can you give me some tips on sand shots? 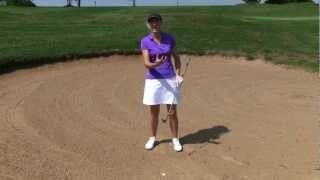 What is the best stance to get out of a greenside bunker? I have been told to use a pitch shot and position the ball in the middle of my stance. I have inconsistent iron play with distance and control and also trouble with fairway sand traps. Can you help? Any simple thoughts or suggestions for dealing with different types of sand, such as fluffy deep sand versus hard compacted sand? What happens if you accidentally ground your club in a bunker? If even if on accident, is it a penalty? Is it ok to hit a fairway wood out of a bunker? Any specific tips when attempting to do so? What are you supposed to do if your ball ends up in a bunker, but rests against a rake on the down slope? The rake stops the ball from rolling to the bottom of the bunker.